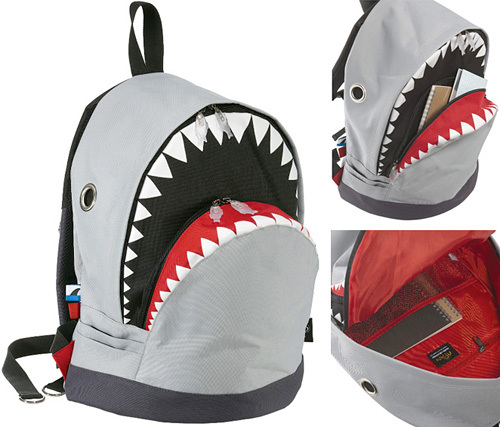 Shark Themed Backpack – Just When You Thought It Was Safe To Go Back In The School… | OhGizmo! Sadly due to school policies most kids wont get to use anything this cool anytime soon. Most require see through mesh or clear plastic due to a handful of nuts bringing guns to school etc. My black Jansport bag I carried through my last three years of high school, as well as using it during my tour in the Army. Its like an old friend. I really hate that the few nutters ruined it for so many kids. it wasn't the “nutters” who ruined school life for kids, it's the power-hungry teachers and administrators who are scared of every little thing they can't control who are ruining school life. Though I suppose you could call them “nutters” too. I'm waiting for the day one of them flips out and decides to ban paper in school because it can cut. The teachers kind of had to adjust after a little incident in Columbine. Before that it was pretty loose and free. I know this is a way old post by now, I just want it absolutely clear that the nutters I am referring to are the hate filled punks who ruined things for future school children, not the teachers who in most cases do not agree with the new measures any more than you and I but are forced to go along with it by overprotective parent groups. They have to enforce the new rules because the alternative is looking for other work, which is not a spur of the moment decision in todays economy. Parents want their kids protected to the point that it is literally like scenes from the movie 1984 to be a tenth grader in todays classroom. If the child has a car it is possible to see where they are, their max speed, all stops made, everything. Their computer habits, phonecalls made and received, each and every connection with the outside world monitored and controlled at all times. These parents are not the majority mind you, but they are the vocal minority who will lean on a school board and threaten to sue should their child not be cocooned from every trace of the unsanitized real world at all times. The school board is in a no win situation between enforcing the parent group's demands, or trying to explain that what the parents are doing will harm the child more in the long term which is hard because the parents immediately take affront to being told they are raising their child wrong.